The great American wilderness is the setting for Wolf Legend MegaWays, a 6 reel slot game from Blueprint Gaming where the number of symbols on each reel changes with each spin. At their maximum they can combine to offer 117,649 ways to win. Look out for cascading symbols, mystery transforming symbols and a free spins round with expanding multipliers. Play on all devices from between 10p and £10 per spin. Set against a rocky desert backdrop, you’ll see A to 9 symbols on the reels alongside a collection of wild animals. In order of value are an eagle, a bull and a big cat. By far the best payer is the wolf which pays 1, 2, 10, 25 or 50 times your stake if you land 2, 3, 4, 5 or 6 on adjacent reels. The action here takes place using the Cascading Symbol feature. After a winner is created, the successful symbols are removed and new ones drop in and replace. These cascades continue as long as a new winning combination hits. Above reels 2, 3, 4 and 5 are symbol positions that change horizontally rather than vertically. These are the only positions that can reveal a wild. The sun-kissed vista is the Mystery Symbol. All instances of this symbol that land on the same spin transform into the same matching symbol which can create some decent winning clusters. The main feature is a 2-part free spins round which is triggered by landing 3 or more bonus symbols on the same spin. You’ll start by playing the Golden Streak feature. The reels are filled with blanks and numbers. Those numbers each deliver an extra free spin to your initial allocation. As long as a number lands, you won’t lose a life. The round continues until you’ve lost all lives. You’ll then be offered a choice with the Gamble feature. If you like the number of free spins you’ve won, you can go ahead and play them. If you’re feeling a little short changed, you’ll be offered the chance to gamble and try and win more streak respins. Spin the wheel and hope the pointer lands in the blue zone. Lose the gamble and you lose all your free spins. The actual Free Spins feature then begin. These come with a Unlimited Multiplier feature which increases following every cascade win. Re-triggers are possible too if you land 3 or more bonus symbols on the same free spin. If you don’t want to wait to trigger the feature you’ll be able to buy it. Just click on the Legend Free Spins Bonus Bet feature tab to the side of the reels. This will set you back 75 times your stake. Wolf Legend MegaWays is a fairly typical MegaWays slot game. The design is pretty simple but is nice and smooth and the soundtrack fits the theme rather well. The gameplay is just what we’ve come to expect from a MegaWays game. The highlight is the Free Spins feature. Land a re-trigger or 2 and the multiplier can really start to motor. You can win up to 50,000 times your stake on each of them. 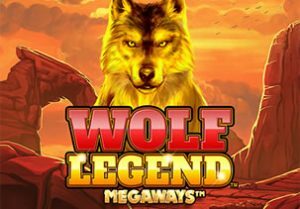 If you’ve enjoyed other slot games that use the popular game engine, then you should find plenty to like about Wolf Legend MegaWays. I also suggest you try Slots O’Gold MegaWays as you can win a life-changing progressive jackpot.